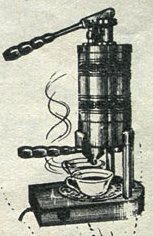 The coffee machines for bars are born in the early 900 and are characterized by a functioning steam. The quality of coffee produced is not exceptional because the steam leaves a burnt taste in coffee. Only in the late 40s will be introduced the piston on the machines, and through the use of water at 90° C will produced an espresso as we drink today. In the early 50s, alongside the production of new machines for bars, begins the production of piston machines (and therefore with a lever) for household use. 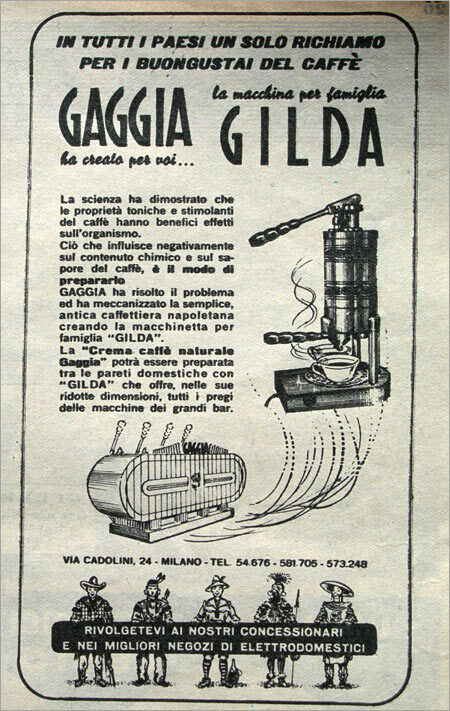 One of the first is the Gilda of Gaggia as you can see from a flyer of the time and from the patent that dates back to 1952. The other historical brands such as Faema, Cimbali, La Pavoni produce, side by side with the generation of models for bar, models for household, while many others brands are born, as Arrarex, Elektra, Olympia, Zerowatt to name a few, to develope a specific production for domestic use. In the late 70s with the introduction of pump machines, the demand for lever machines decreases, and many models disappear from the market. Remains a niche market for "connoisseurs" , out of information campaigns and advertising based on the "mouth". We can classify the lever machines in two types: those with piston actuated by a spring (La Cimbali, Elektra, FE-AR ...) and those with piston actuated manually (Arrarex, La Pavoni). The operating principles and main components are similar for all models, a boiler with an heating element to heat water, one group and a piston actuated by a lever for the production of the espresso. The application of this principle, the quality of materials, originality of design are specific to each model. © 2008-2009 Francesco Ceccarelli. All rights reserved.